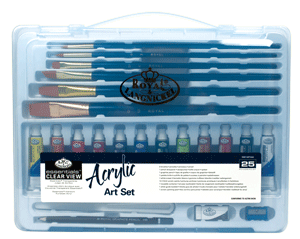 Acrylic paints are a staple in any artist’s supply cabinet. 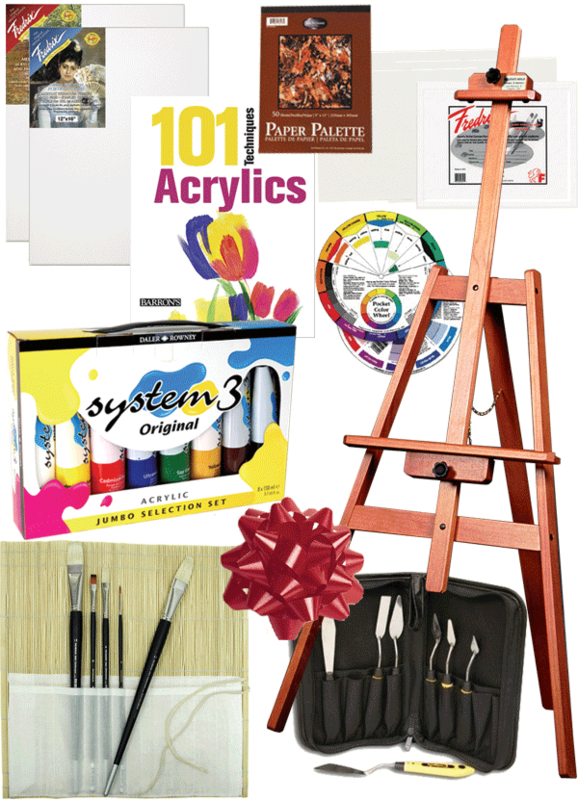 Rex Art has a comprehensive selection of acrylic paint gift sets and acrylic paint kits for 20% up to 80% off retail prices. 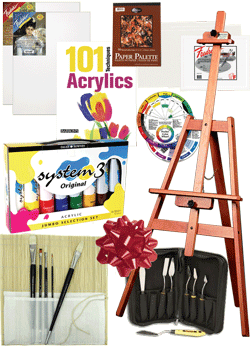 Acrylic paint gifts are an affordable gift to yourself or a loved one, and an ideal way to refill dwindling supplies. 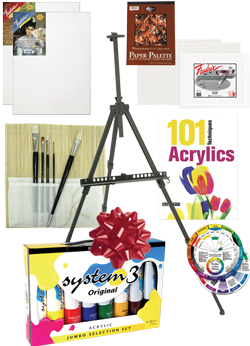 For budding amateurs beginning their journey into the world of art, Rex Art has a number of acrylic paint starter sets complete with everything you need (including easels, canvases and instructional booklets) to create a masterpiece. 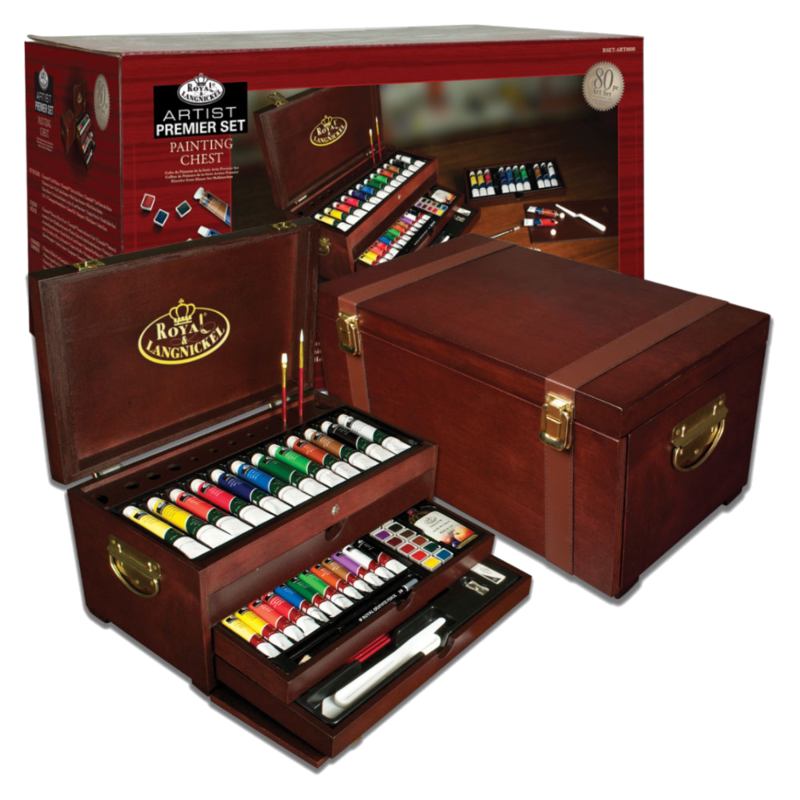 At Rex Art, we have been passionately involved in the art supply business for over 50 years, and we want everyone to explore the bounds of their creativity. We select only premium quality products and strive to offer them for unparalleled value. 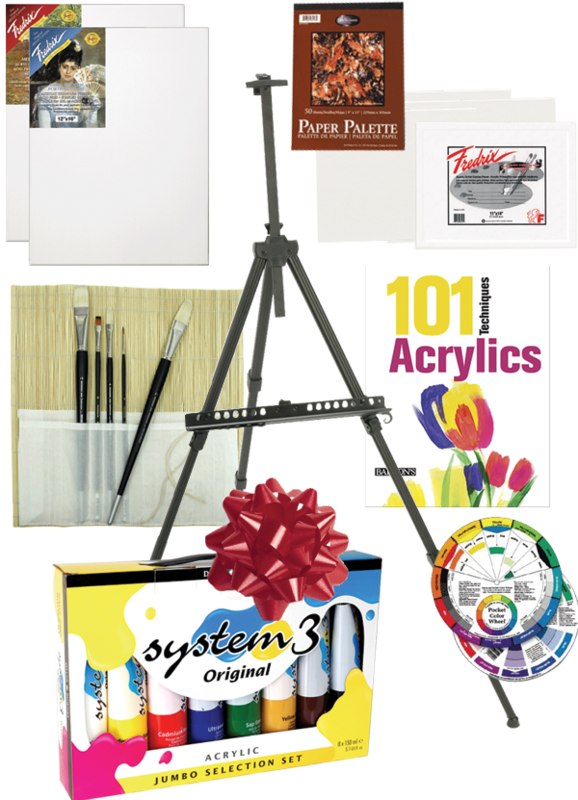 If you need assistance choosing acrylic paint gifts, give one of our knowledgeable, professional consultants a call at 800-REX-ART2. A selection of 7 pelette knives in a handy durable zip case, ideal for a wide variety of painting techniques. This selection of 7 palette knives is ideal for a wide variety of painting techniques. Created for the discerning artist, Daler-Rowney palette knives are a perfect blend of functionality, quality and elegance. 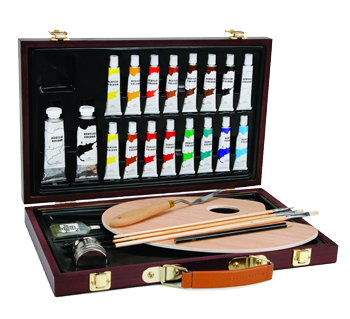 This selection of 7 palette knives with a variety of blade shapes, is ideal for a wide range of painting techniques. 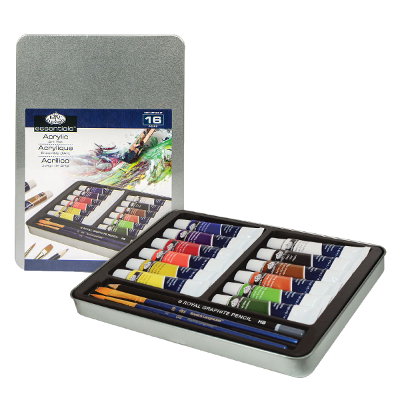 Created for the discerning artist, Daler-Rowney palette knives are a perfect blend of functionality, quality and elegance. The distinctively shaped blades of the Special Effect knife collection are excellent for heavy body painting techniques such as impasto, creating a wide range of textures and effects in colors, mediums, texture gels and other media. 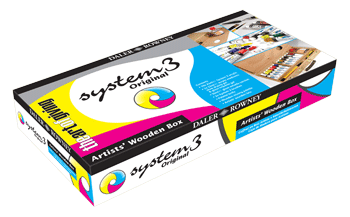 System 3 is a high quality versatile water based acrylic paint. 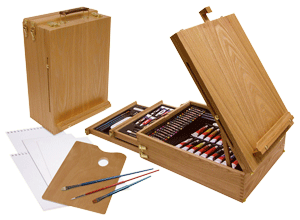 It offers an excellent painting experience at a most economical price. 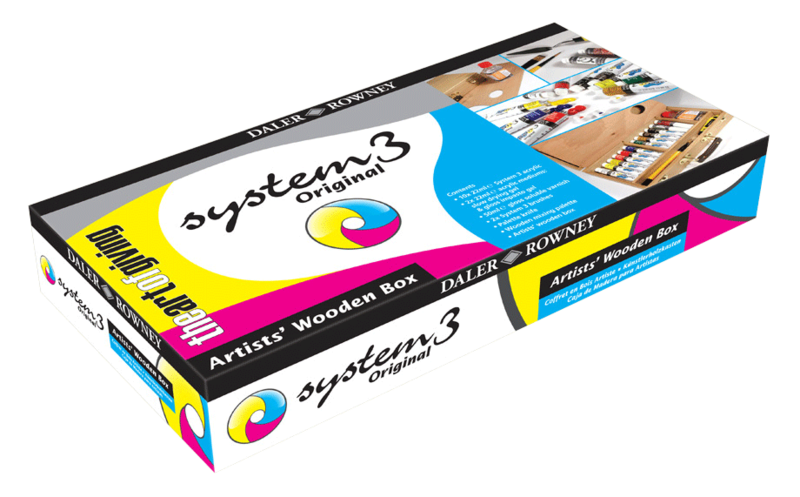 System 3 offers all the virtues of light-fastness, permanence, covering power and flexibility of a more expensive paint. 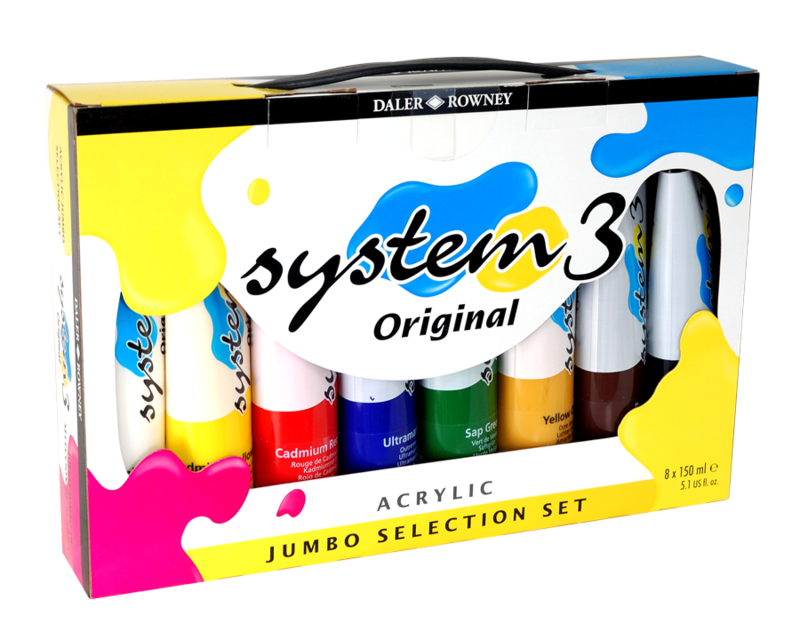 System 3 Acrylics are ideal for art, craft and design projects in colleges and schools in addition to being suitable for both the amateur and professional artist. 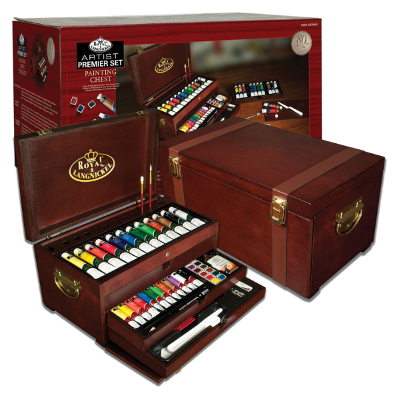 This beautiful set contains 12 full size 75ml tubes of System 3 Acrylic paint and two System 3 brushes in a deluxe wooden box. 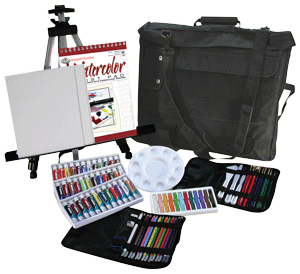 This Daler-Rowney Acrylic Starter Set is a great deal. 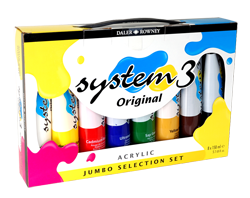 It contains 5 large tubes of acrylic in the standard primary mixing colors: Primary Red, Primary Blue, Primary Yellow, Black, and White. Porcelain surface makes clean up a snap! 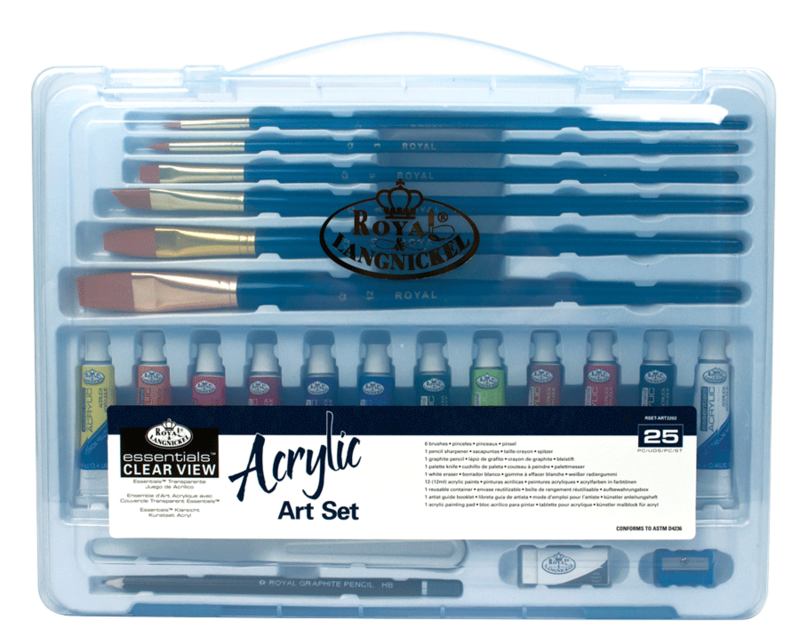 Royal & Langnickel Medium Tin Art Sets offer a generous collection of premium quality art supplies in one medium sized tin. 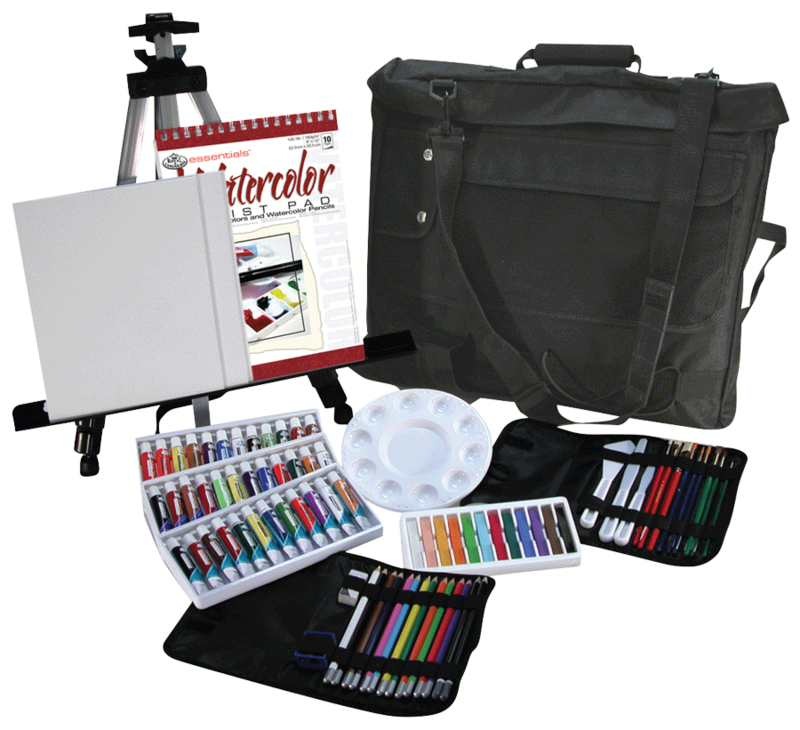 Easily take art supplies with you while traveling by slipping this compact tin into luggage for worry-free portability. The durable, sleek silver tin keeps supplies neat and organized while protecting them from any damage. 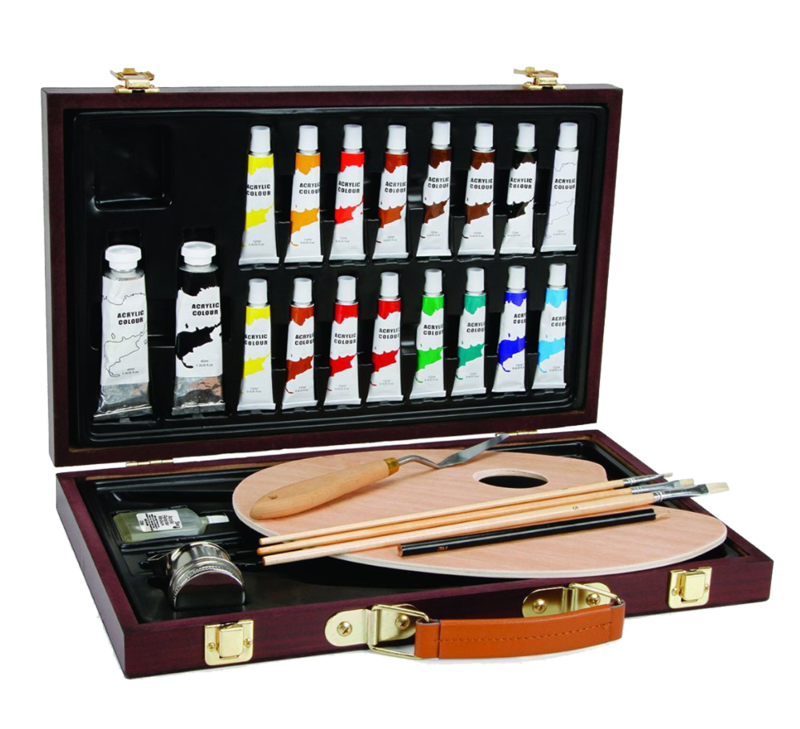 A selection of brilliant, highly pigmented Winsor & Newton Galeria Acrylic Paints and essential painting accessories makes for an impressive gift bundle sure to please any acyrlic artist. 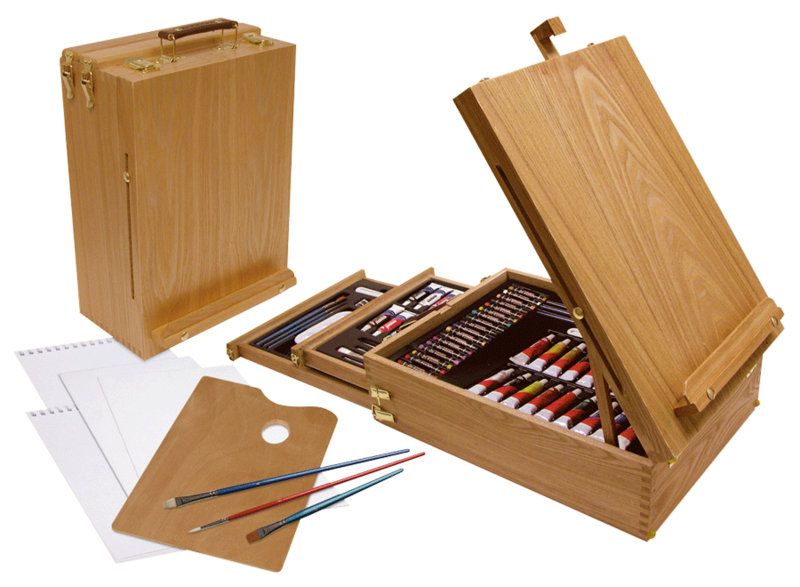 A great gift for the acrylic painter who enjoys tapping into their creativity on-the-move, this classic wooden box contains acrylic essentials that are a must for anyone looking to get more serious with acyrlic painting.